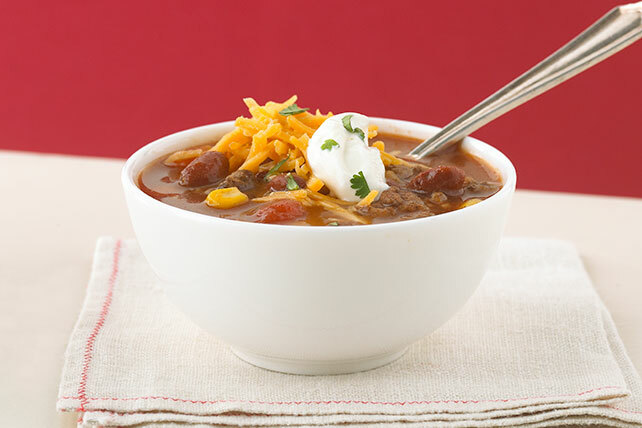 Get a little heat and a lot of flavor with this delicious taco soup. Learn more about this easy dish that looks like soup but tastes like tacos today! Brown meat with onions in large saucepan; drain. Return meat mixture to pan. Add all remaining ingredients except cheese; stir, breaking up tomatoes with spoon. Bring to boil; simmer on medium-low heat 5 min., stirring occasionally. Serve topped with BREAKSTONE'S Reduced Fat or KNUDSEN Light Sour Cream, and chopped fresh cilantro.